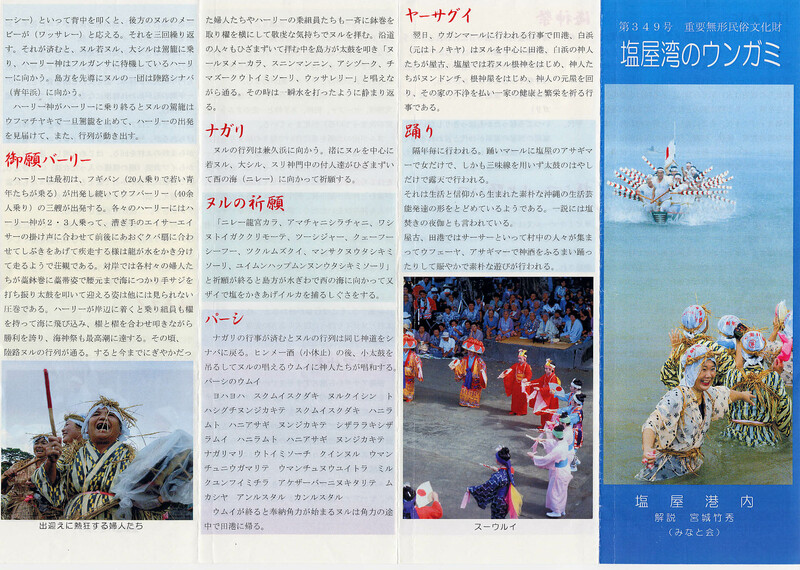 This harvest festival is held every year on the first day after the Obon Festival of the old lunar calendar. 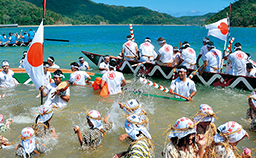 The Unjami (or Ungami) Festival was held in ancient times in Okinawa’s northern towns, its form changing throughout the years. 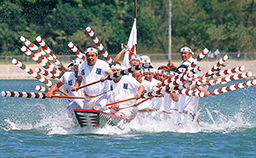 In Shioya Bay, the event largely remains unchanged from days gone by, and it is considered a grand occasion. The event has been held without fail each year on the first day after the start of the lunar new year. It retains its traditional format and protocols unbroken into the present. There is a strong lineal aspect to the festival: priestesses representing each local family clan perform the rites. Participants are proud of the festival and show strong solidarity. All villagers actively take part in the event out of pious devotion to their ancestors, and they feel strongly about continuing the tradition and making it a lively occasion for years to come. Though there are no clear records, its format and prayer rites (songs of supplication) are slowly being simplified and abbreviated over time. There are few successors to the current shrine maidens. How do we link the event as a piece of cultural heritage to people’s lives today? “Morning and evening, we never fail to call to mind the faces of those we loved – just as noon and night, the fires of salt boiling never wane in Shioya.” -- Ryoku Yonabaru. This traditional Okinawan piece of poetry, used in classical dance forms, is inscribed on a stone in Hāminzō (a forest in Shioya that was formerly called Tinchiji). The poem brings to mind the beauty of nature and the way our ancestors, over long years, extolled the virtues of nature while simultaneously battling the wind and rain to build their way of life. This rich human spirit gave root to our folk culture, a set of humble traditions, folklore, legends, and rites that continues to the present. Of these folk traditions, the oldest and most widely extolled has been the Unjami Festival. Sacred places that is God come down and Asagi. 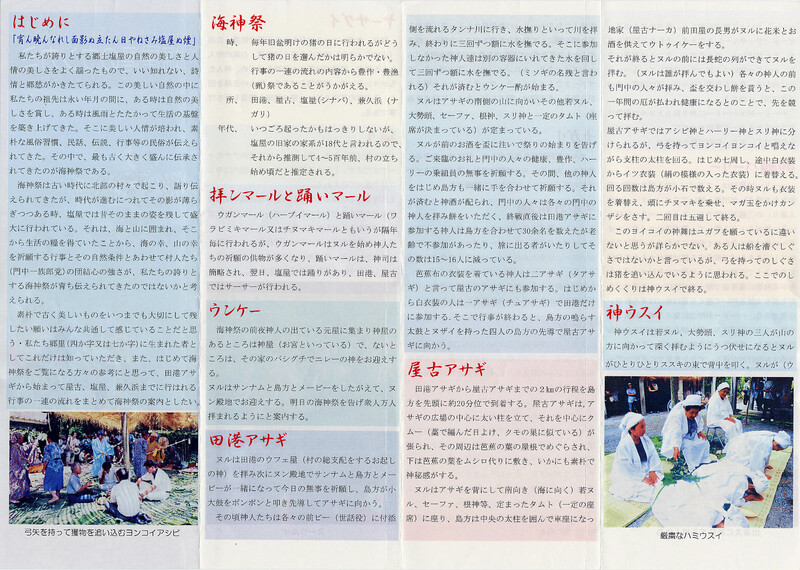 I will do "Unke (pick-up)" on Shinto ritual priests greet God on the eve of Ungami. The next morning, priests purify themselves in the river Tanna, He will pray for good harvest and good catch safety and health of Ungami in Asagi of Tanna. Then, after telling the beginning to God, to distribute the rice cake and sacred sake to worshipers, and share the joy of God visit. 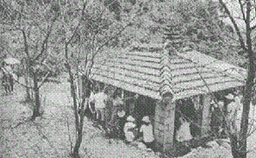 In Yafu Asagi, to resemble spider web, to make awnings. And (men) will continue chanting "Yonkoi, Yonkoi" the priest sat in the center of the circle. While the push-up in the upper left corner bow In addition, he walks clockwise. ※ please download. In addition, the original document size is B4. Copyright © 2014 Ogimi Village All Rights Reserved.